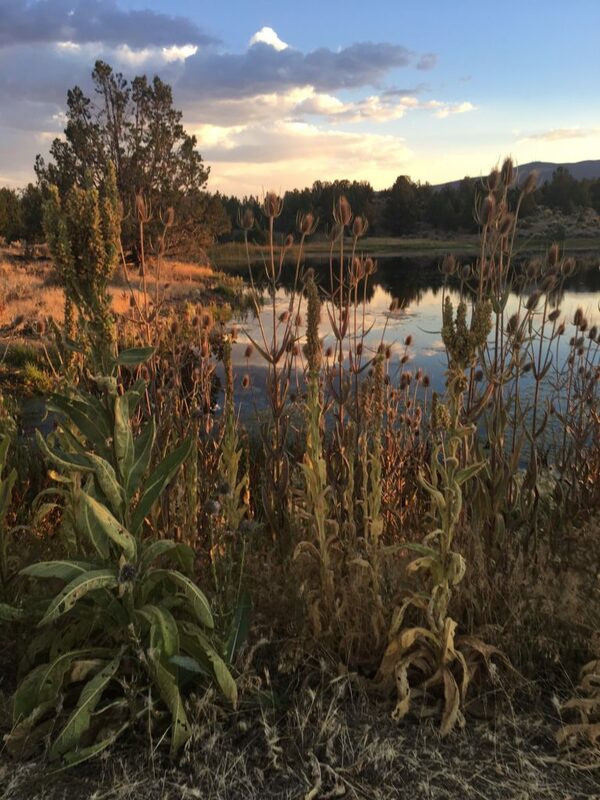 This is where my husband, kids, and I found ourselves staying in August, a few weeks into our full time RV travels. The questions “Where the heck are we?” and “What is there to do here for a whole week?” may have crossed my mind. To our surprise, it ended up being one of the most memorable experiences from the past 6 months, and a place we hope to return to some day. 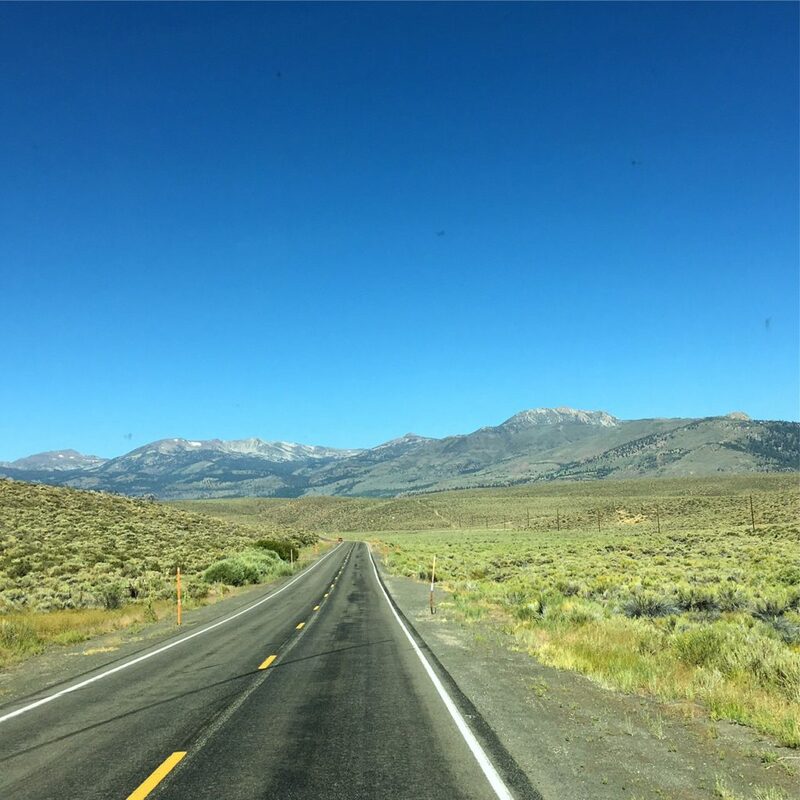 The 200+ mile drive on Route 395 from Lake Tahoe was truly remote once we pushed north of Reno. The last gas station before Likely is in Standish, over 70 miles to the south. You’d have to detour west from Standish to Susanville to find a restaurant. 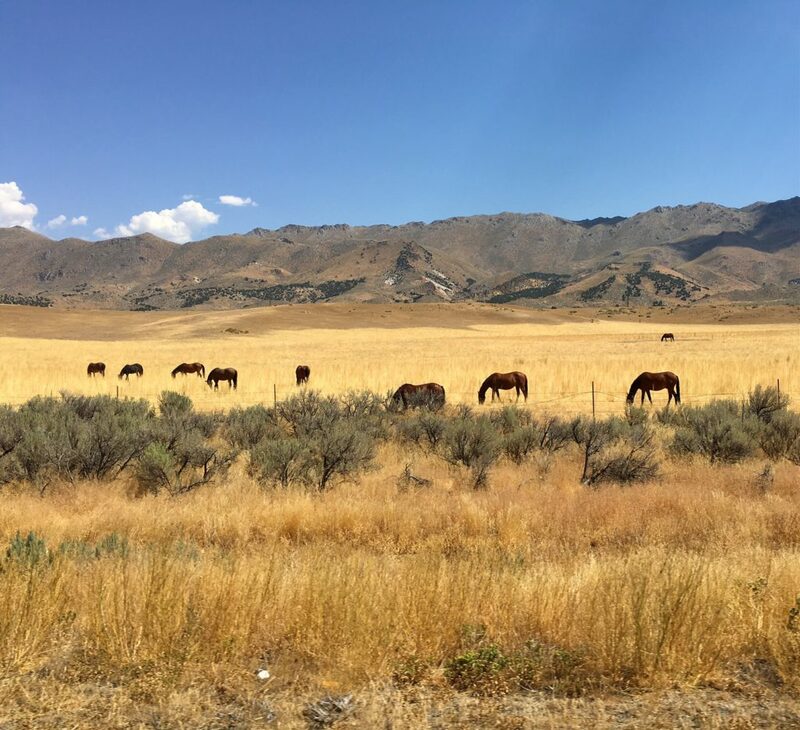 With a full tank of gas and a stocked pantry in our home-on-wheels, we set off on the last leg of 395 with nothing in sight but mountains, forest, meadows, and the occasional herd of cattle or horses. The Likely Place Golf & RV Resort was our home for the week. It was also the only accommodation in town. There was a small store at the surprisingly busy golf clubhouse, which also served up fresh breakfast and lunch, and a delicious homemade walnut bread. 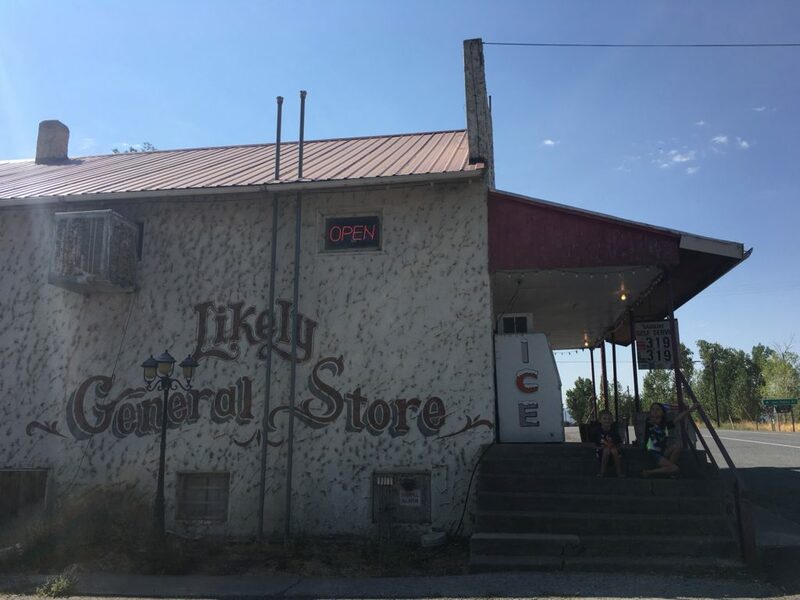 Back over on the main drag, the Likely General Store ended up being a gem. The well-stocked store sold local meats and sausages, and had a big section in the back with gear for ranchers, including tools that we found useful for RV living too. The service was friendly, and local kids sold lemonade on the front step. Our surroundings were breathtaking: desert scrub gave way to miles of open land surrounded by distant mountains. That first evening I took the dogs for a walk and witnessed one of the most sublime sunsets I’ve ever seen, reflected in a small pond edged with cattails. If that wasn’t enough to convince me of the appeal, the giant full moon rising low over the distant horizon, followed by a sky full of bright stars, did the trick. The next morning we ventured to the county seat town of Alturas for some breakfast and shopping at the nearest chain drugstore. The 20 mile drive passed through the Modoc National Wildlife Refuge, part of a chain for the Pacific Flyway. 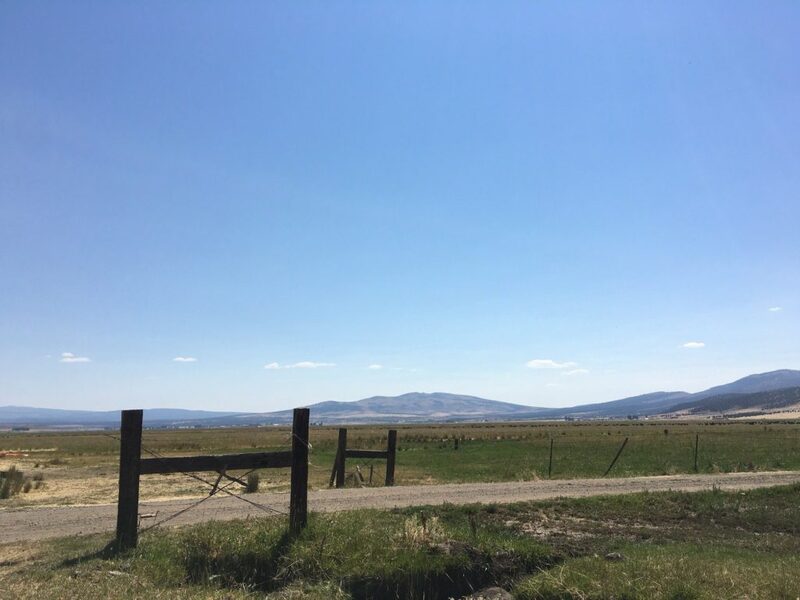 We spotted cranes and egrets, and even some pronghorn antelope, who were busy ignoring the Refuge borders and grazing on crops in someone’s field. 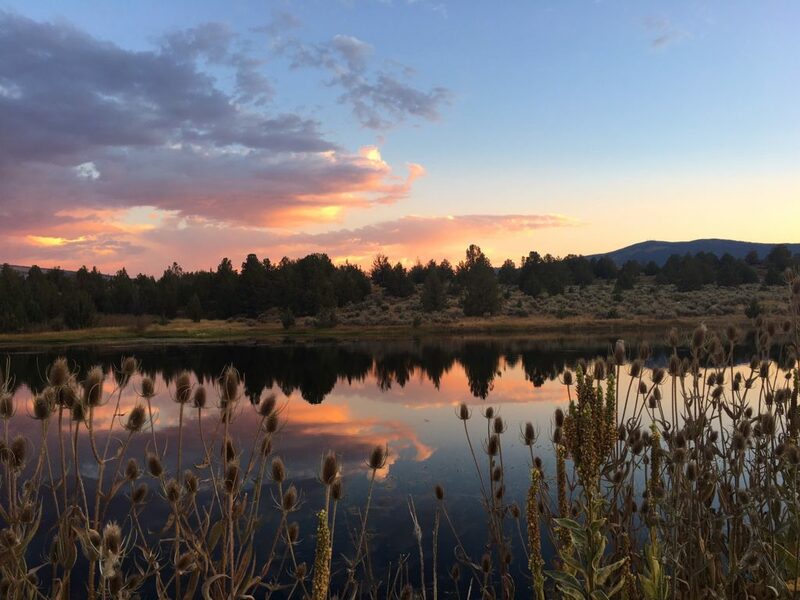 If you’re not equipped with an RV or tent to stay in Likely, Alturas is a good base to explore the area. There are a few chain and independent hotels in town, most notably the Hotel Niles from 1908 with a grand presence on Main Street. The Niles is reputed to be haunted, although our kids did not want to stick around to find out for sure. An attempt to visit the California Historical Landmark in the area turned into an adventure. 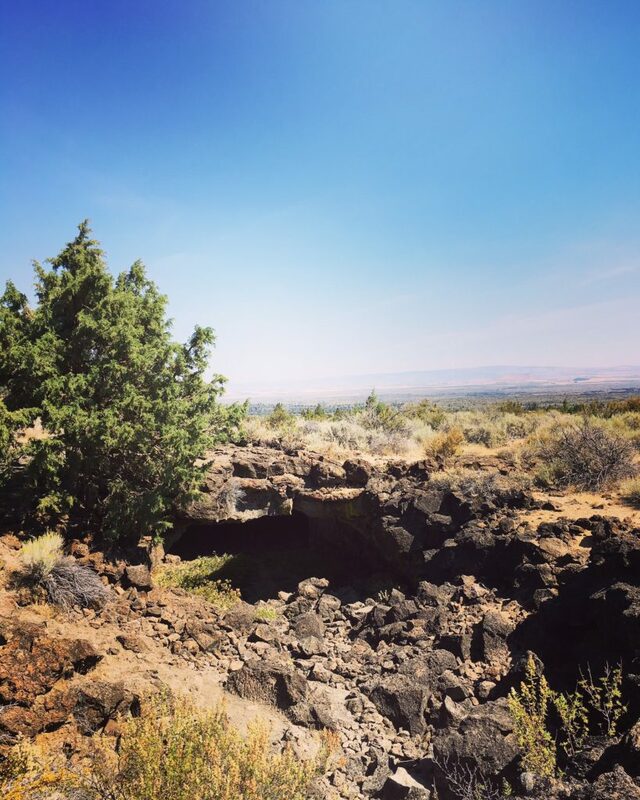 The Infernal Caverns Battleground was the site of a famous 1867 battle between US soldiers and the Shoshone, Paiute, and Pit River Indian Tribes. There is plenty of information online about the battle itself, but not so much about how to find the Historical Landmark. We ended up driving a few miles on a narrow, rutted, and muddy unpaved road that we were pretty sure was private. We finally found a small marker at a wooden fence, and could see six soldiers’ gravestones further up in the hillside. We were willing to jump the fence, but not to venture on the muddy trail covered in cow patties for a closer look. 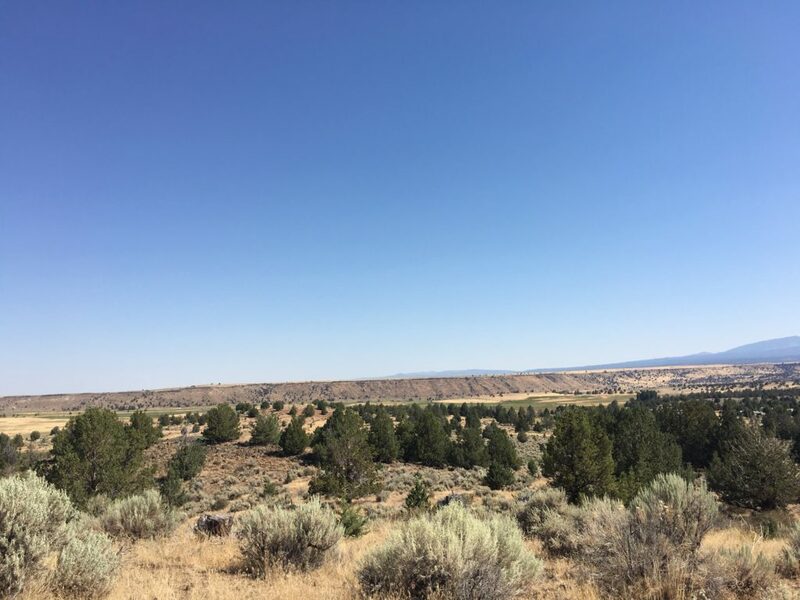 Much of Modoc County is federally protected land. There’s some incredible hiking in the South Warner Wilderness that we missed out on, being accompanied by a 7- and 5-year-old. The one hike that we did take to a waterfall and mountain lake was perfect with the kids and dogs, and we had it all to ourselves. 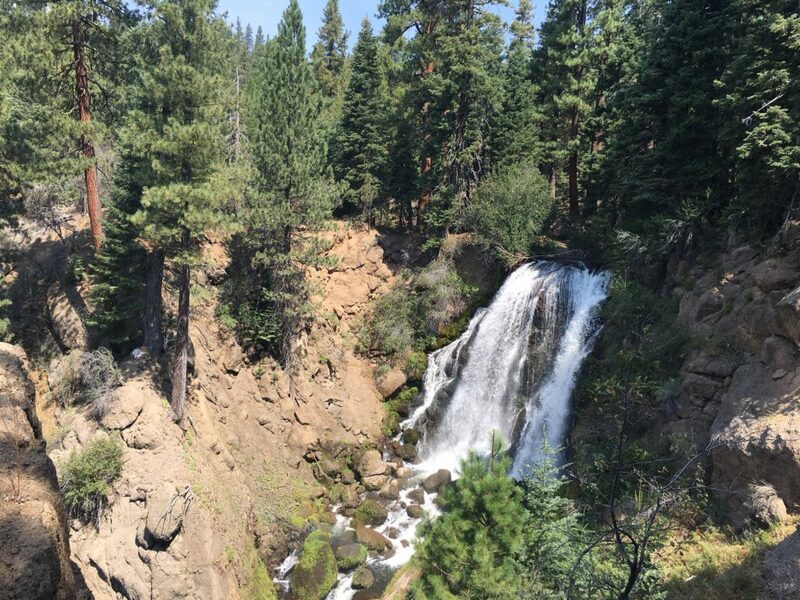 After a drive into the mountains, with a gorgeous farmland valley that appeared suddenly, like Shangri-La, we found the Mill Creek Falls Campground. The falls were a half mile walk from the trailhead and pretty spectacular, with a 75-foot drop. We hiked another mile through thick pine forest, with the dogs happily off leash, to the beautiful and surprisingly large Clear Lake. Our next excursion took us to the Modoc County Fair, which we discovered from a flyer hung on the community bulletin board at the Wagon Wheel Cafe. Apparently, the crowds came later in the day; we arrived a few hours before the horse riding and rodeo competitions were scheduled. Still, we had fun exploring the grounds and the juried exhibits of local artwork, quilts, and an interesting category of all different types of “collections”, from vintage gloves to miniature furniture. The midway had half a dozen carnival games, and an enthusiast barker with a microphone who tried to encourage the few kids around to join in events like toy lawn mower races. 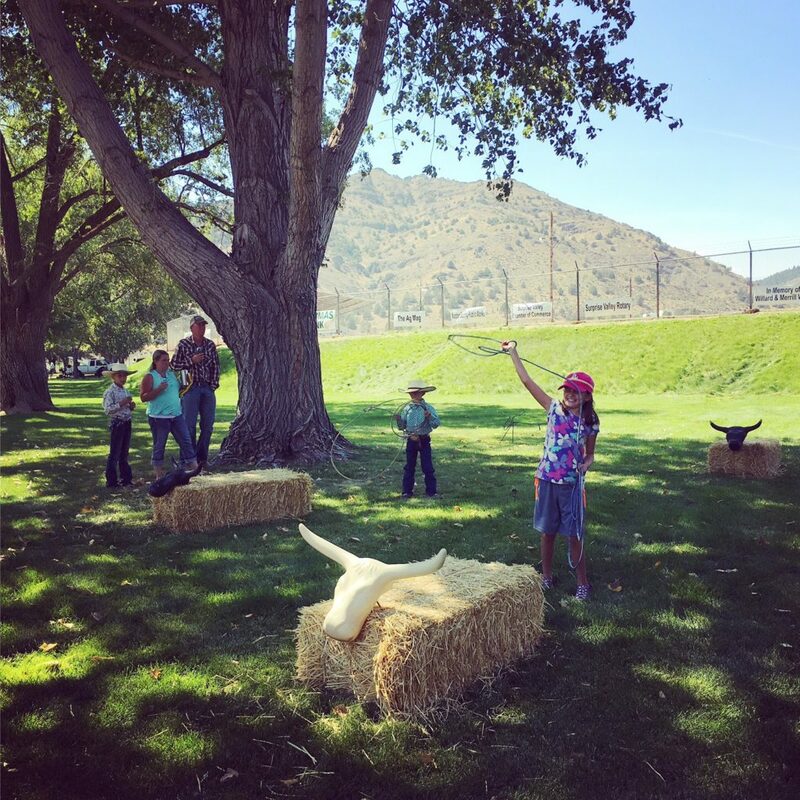 Our 7-year-old daughter gamely stepped up for the kids’ lasso throwing contest, which had plastic cattle skulls mounted on bales of hay. She’d never thrown a lasso before, and we certainly couldn’t give her any tips, but after the contest, a cowboy stepped in and gave her a one-on-one lesson with his own rope. 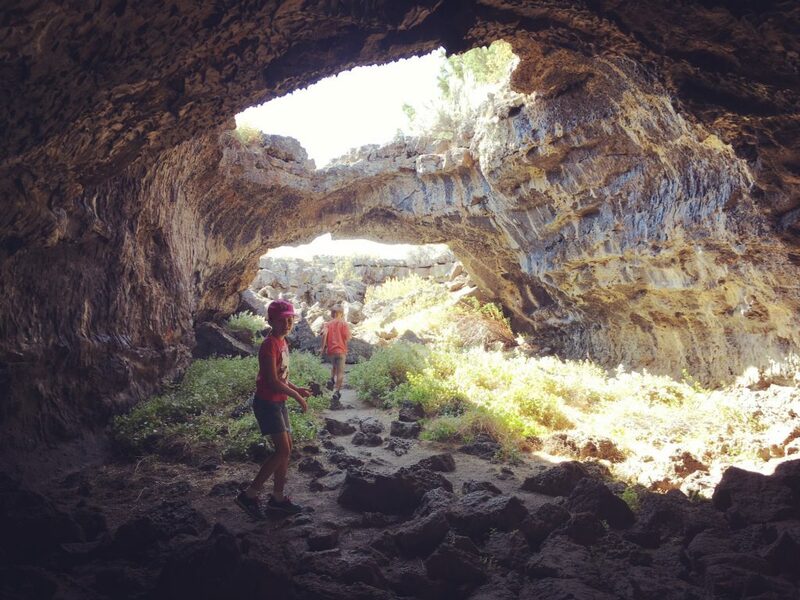 The surreal landscape at Lava Beds includes 700 lava tube caves, with over 20 at varying levels of difficulty that can be explored on your own. We had one of the most memorable National Park experiences as a family when we hiked the Sentinel Trail – over 3,200 feet in the pitch black except for our flashlights, which are helpfully available at the Visitor’s Center. The four of us were by ourselves the entire time as we scrambled over rocks, up iron ladders, and, for about one second, stood in total darkness when we agreed to turn the flashlights off. 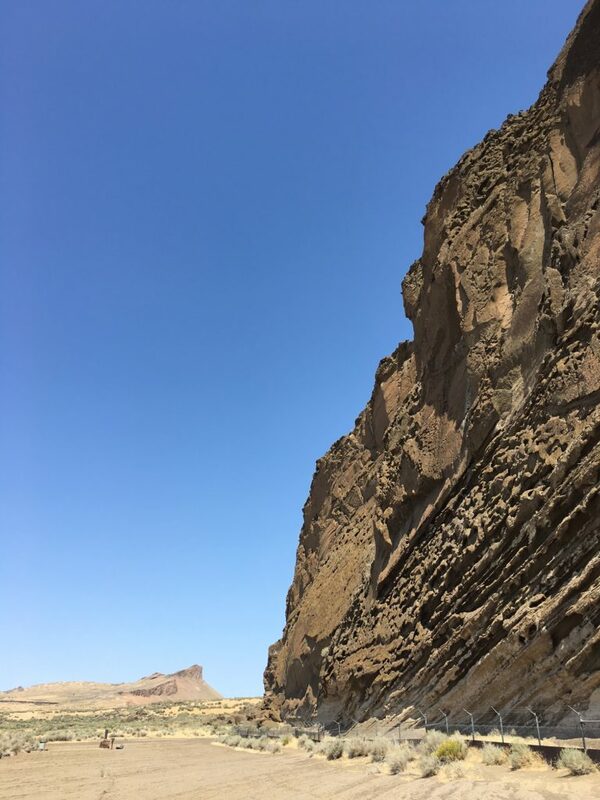 The National Monument also includes Petroglyph Point, an incredible display of thousands of individual carvings, estimated to be at least 5,000 years old, on a former island in ancient Tule Lake. It’s one of the largest panels of Native American rock art in the West, and another place we had to explore by ourselves. The rest of our time was simply spent relaxing at the RV park. We saw cowboys leading cattle through fields, lizards and cottontail rabbits, sunsets and sunrises, and shooting stars. We took daily walks, with the dogs running around off leash, in the miles of desert scrub around us. I found myself singing “Home on the Range” or “Don’t Fence Me In” as I gazed upon the intoxicating open land and sky and distant mountains. 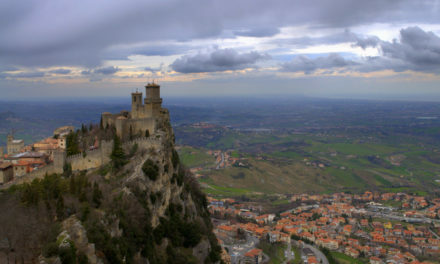 The fact that we ended up in Likely at all is certainly part of the beauty of traveling full time: we can pick a random place on the map, without being sure what we are getting into or worrying about using up precious vacation time. 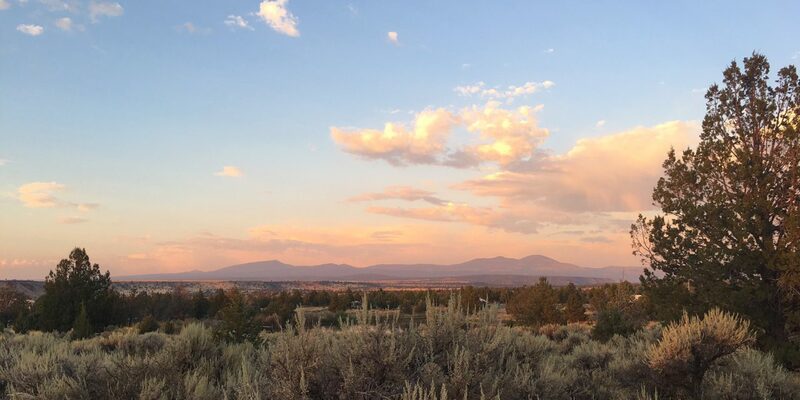 But even if the answers to my initial questions were “In the middle of nowhere” and “Not much”, I would recommend Modoc County and a town called Likely to anyone looking to experience a slow pace and stunning natural beauty that feels undiscovered, even in California. Michelle Neale’s love for travel started at an early age taking family road trips along the east coast of the US, and she's had the opportunity to explore internationally during a junior year abroad in Paris, and 20 years of working in the travel industry. She left the office behind this year and embarked on a full time US road trip with her family in an RV, photographing and writing about their adventures. She blogs at Neales...on Wheels!. Follow her on Instagram. 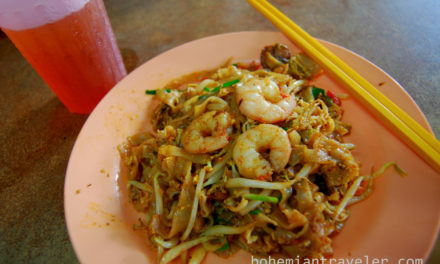 So happy you appreciated and found our corner…Modoc. I love where we live and enjoy sharing with those who enjoy the great wide open. Thank you, Sandy! I’m glad you enjoyed the article. 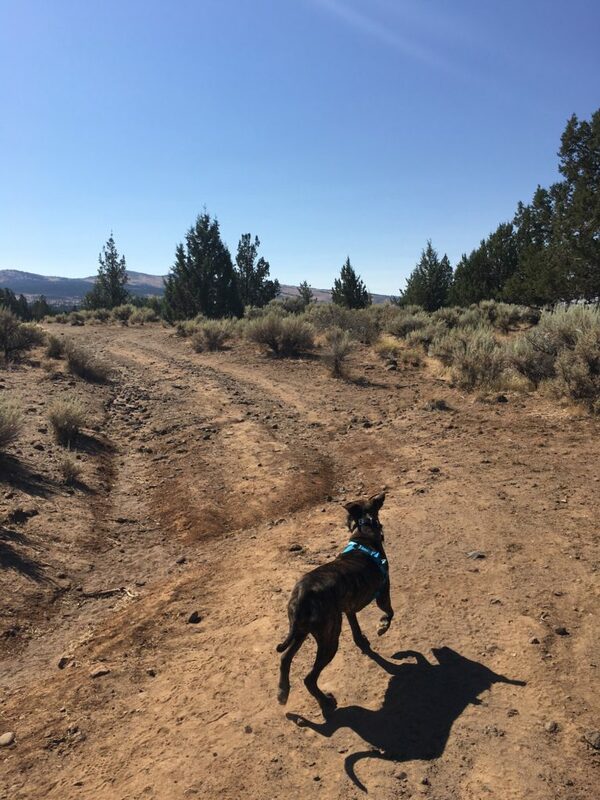 We were enchanted by Modoc, can’t wait to return. The next time you head to Modoc County, try visiting the Modoc County Museum. 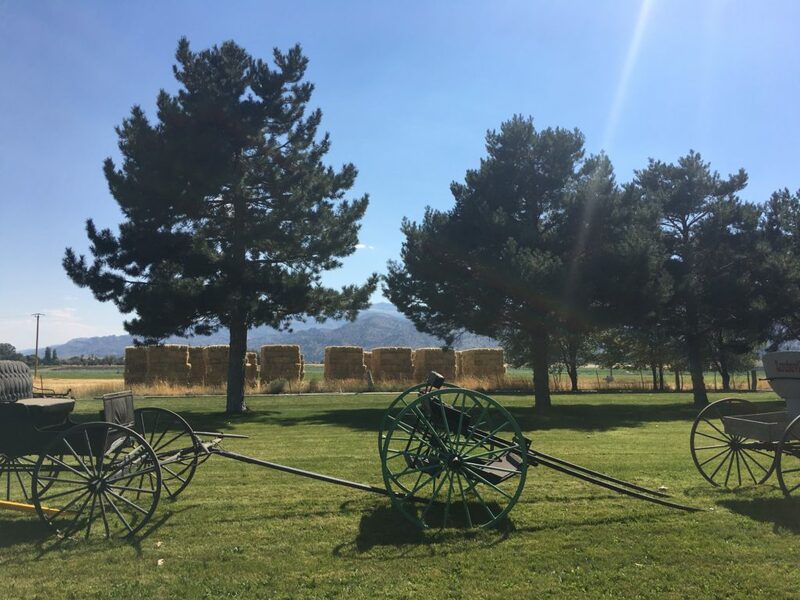 It’s operated by volunteers with the Modoc County Historical Society and the Alturas Chamber of Commerce. The museum has amazing items on exhibit. It’s usually open during Fandango Days, an event held near the 4th of July….first Saturday in July. The event includes a wonderful parade, plenty of fun activities and food at the park across the street from the museum. Once your children become a bit older, the South Warner Wilderness will be a must for exploring. Thanks, Valerie! I’m sorry we missed the museum, will be sure to visit our next time around, and try to time it with Fandango Days. Sounds fun! Likely is such a hidden gem! Thank you, I’m so glad you enjoyed the article! I would love to delve deeper into the rich history of Modoc; thanks for the lead. Can’t wait to go back and explore more. Hi was hoping I could use your top photo in this page for a wayside exhibit I’m working on for the BLM. Its purely for educational purposes.